With the introduction of the Samsung Galaxy S9 and Galaxy S9+, Sammy chose to strike back at Apple's Animoji with its own animated avatars feature — AR Emoji. It goes about things differently — instead of creating 3D versions of popular emoji, like Apple did, Samsung's version asks you to take a selfie and then creates a virtual, cartoon version of you. Kind of like Bitmoji, though Sammy does it a bit better — we'll get into that. There's also a pick of new AR stickers, some of which are now in full 3D as well. Hey, you can be the Zootopia bunny! 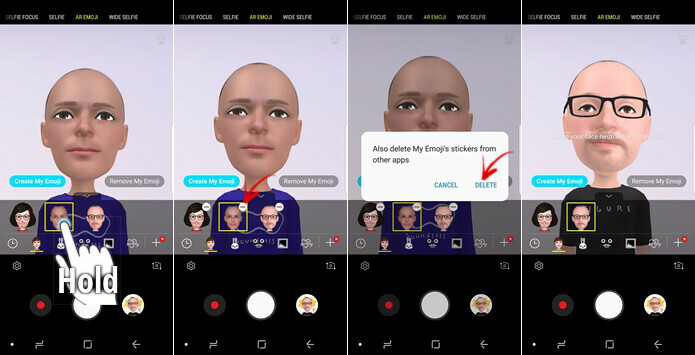 Once your AR Animoji is created, you get a bunch of stickers with your personal avatar, which you can share in absolutely any messenger app you are using, and you can also record videos or take photos where said avatar mimics whatever you are doing in front of the camera right now. Let's see how all of this is done! There is no separate app to look for in order to access the AR Emoji features. To create your virtual self, open up the Camera app, go into selfie mode, and swipe left once to get to the AR Emoji mode. Now, you should see a Create My Emoji button at the bottom left. Tap that and the app will ask you to take a selfie. We recommend that you do this in a well-lit environment. If you are wearing glasses, we recommend that you take them off — you can add virtual ones later — and make sure to hold the phone really steady. This is because AR Emoji actually takes parts of the picture you take and blends them with the textures of the avatar's face. So, if you have glasses on, the AR Emoji might end up having just parts of the frame weirdly hanging over its nose, and if you take a blurry photo, features like eyebrows or beard might end up a bit hazy. As we said, better remove your glasses if you are wearing any. You will be able to add virtual ones later. 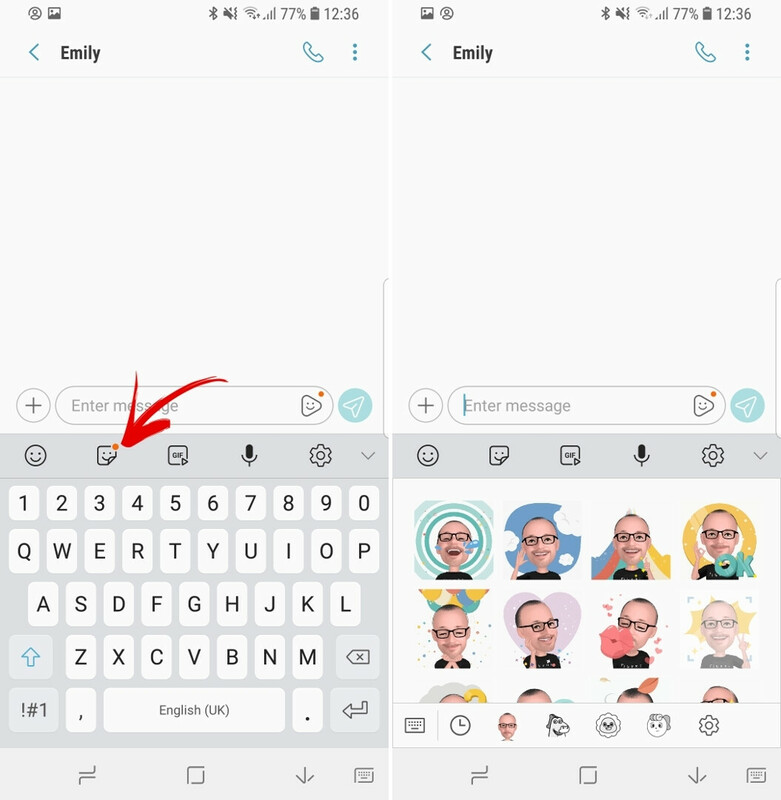 When you press OK, the phone will auto-generate a number of stickers that feature your virtual self and have them ready for use within any messenger, as long as you are using the Samsung Keyboard. And there's the animated version of our Galaxy S9 user! Once you've taken your photo, you get to fine-tune some details — choose from a gallery of haircuts, select hair color, add glasses, and change your emoji's clothes from a selection of outfits (whole outfits only, no piece-by-piece editing). You will notice that you can create more than one AR Emoji — you can either scan friends' faces or add multiple versions of you. If you want to remove an AR Emoji from your phone, go back in the Camera → AR Emoji menu, tap and hold on one of the faces until a “–“ sign appears on them, then tap that to delete the one you want. Now, here's why a Bitmoji comparison here is unfair — first, Samsung's AR Emoji are 3D. Secondly, Sammy does use the selfie you take to add a transparent texture to the avatar's face, making it look more like you. Notice how our subject's beard was actually plastered over the AR Emoji avatar's face. 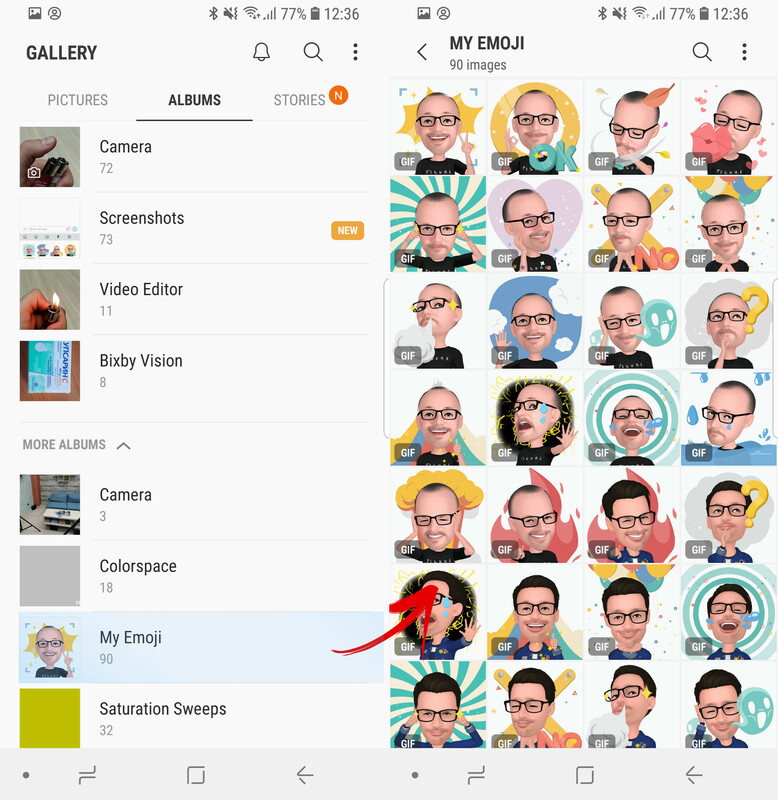 In other words, Samsung's version is “better”, for what that is worth, but Bitmoji still has its own aesthetic since it's strictly 2D, making it more comic-like. As we touched upon, there are two ways of using AR Emoji. The quick and easy way is to tap on the sticker icon above the keyboard. Once in the sticker menu, you will see a tab with your AR Emoji on it. These are quirky little animations that use your virtual avatar. 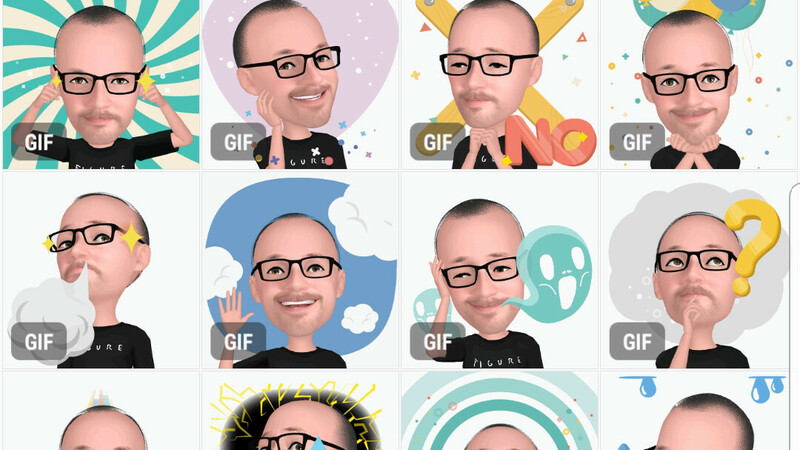 Hot tip: when the Galaxy S9 creates the stickers for the first time, it will save them as images in your Photo Gallery by default. You can use that to download them to your PC and / or share them in different ways outside of your Samsung Keyboard. Feel free to delete them if you don't want them there — this will not delete the actual stickers from the Keyboard. The second way you can use AR Emoji is by taking a photo or record a video with them in it. Open the Camera app and go into AR Emoji mode — you can do this in both the main camera mode and the selfie mode. Once there, you can pick what you want to use — your custom avatar, or one of the many AR stickers available. Voilà — the AR Emoji is on screen and ready to mimic your movements and expressions. Well, it's kind of janky and weird, but it's there. And we would be lying if we said we didn't get a chuckle out of some of the clips that people in the office recorded with it. There you have it! Happy AR Emoji... ing. How to use? Do not use Samsung Emoji. Do you have the phone? Asking for a friend. No I'm not. I'm asking cause if you don't have & don't plan on getting the phone, your comment is pointless. And if you do & don't use it, it's not the end of the world. Normal people only compliant about what they don't have, not what they have. "...but when comparing the armoji to my friends animoji... the tracking is terrible..." Tracking from initially setting it up or once it's been created? Oh okay. I won't experience this until the Note 9 unless it comes to the Note 8 (doubt it though because they'll most likely feel no one will upgrade). I only briefly played with it at Best Buy, but my main reason was to compare the camera to my Note 8. The tech involved in Apple's animoji is way more advanced than what is going in with the ARemoji that is the in S9. Neither of them are particularly "useful" but either of them are neat enough that its cool to have. oh well, then stop using it? some might use it though plus, wait for some updates to make it better? Nothing comes out as a perfect thing, they need time to grow, mature and to be polished dear! My wife loves the idea, I could care less about it. Does it bother me no, but my wife for sure will send me some crazy looking animations. When brands start to produce and offer such emojis regardless if it is samsung, apple or any other, it simply means they do not have that much new significant features to offer and try to cover buyer's eyes with such totally useless feature. Better camera, better processors and most importantly longer lasting batteries is what users need. longer lasting battery will add way heavier weight than it should be, dear, cos S9+ already has way too many things, that other phones lack, like 3.5mm audio jack, stereo speaker, fast wireless charging, fast charging etc, with 3500 mAh and with help of power efficient CPU & GPU, you can get more screen-on time though! But I use Swift Key, and cannot figure out how to use the emojis.